The title of the book, Stay Hungry Stay Foolish is inspired by the last sentence of the commencement address given by Steve Jobs at Stanford in 2005. In his landmark speech, Jobs chronicled the ups and downs of his life and explained how the low points in his life helped him in achieving great heights. The book is about 25 entrepreneurs who graduated from IIM Ahmedabad and chose the difficult path of entrepreneurship rather than joining or continuing with cushy jobs, high salaries and like Steve, had their low points but did not give up. The author, Rashmi Bansal is an alumni of the institute and an entrepreneur. The oldest alumni profiled in the book graduated in 1967 from IIM A whereas the youngest in 2004. Most of them were from middle class backgrounds and had been to some of the best colleges in the country as under graduates. Many would be surprised to read that for quite a few of them, taking admission into IIM A was not a result of any well planned strategy but a decision taken almost at the last moment. In those days, IIM aspirants were still in four digits unlike today when more than two lakh people take CAT (IIMs entrance exams). The book was commissioned by IIM A probably to drive home the point that it does not just produce people who can sell financial instruments & soap. But after reading the book one does not get the impression that the institute imbibes the culture of entrepreneurship in its students. All the people profiled in the book were either Believers (people who knew that entrepreneurship is the chosen path for them even before they joined IIM), Opportunists ( who seized their chance when they saw it, much long after graduating from the institute) or Social Entrepreneurs. There is no instance where the premier B School of the country had influenced or inspired anyone to be an entrepreneur. Of course most entrepreneurs give credit to the “insurance” of a job that an IIM tag gives them and the alumni network which played a very crucial role in some of the success stories covered in the book. But what about the primary function of any educational institute? Was there any special learning from the institute or any special moment within the institute which played a crucial role in their decision to find their own way ? Very few. A few did take some entrepreneurship electives and the institute now boasts of an incubator (the book is funded by the same) but for most, the institute played little or no role in inspiring or guiding them to strike out new paths. One wonders what would have been the fate of the same people had they not been a part of IIM A or for that matter any B School ? Would they have been still successful without the “insurance” of a well paying job or the alumni network ? Does a believer really need an MBA education ? Probably a Stay Hungry Stay Foolish – Part 2 which covers entrepreneurs who had not been to B Schools can answer such questions. Of the profiles covered in the book, there is a good mix of people from different sectors. From the founder of naukri.com, manufacturer of Sintex tanks, a sugar baron to the founder of First Micro Finance Institution in the country. Each chapter of the book is actually a candid interview of the author with the people profiled. Of course, it would have been better if more research was done rather than just basing the entire chapter on one single interview (the financials seemed to be updated & verified). But then the book is not about the businesses that these 25 people founded but about their never say die attitude. The book does not claim to be a primer on Entrepreneurship but like Steve’s speech at Stanford aims to inspire the younger generation with real stories that it pays to remain hungry and foolish. And the book is more than successful in driving home that point !! Don’t miss this book if you ever thought about striking out on your own but were bogged down by the risks involved. As the book says, in life there is always risk involved and security is not everything. I can’t agree more. 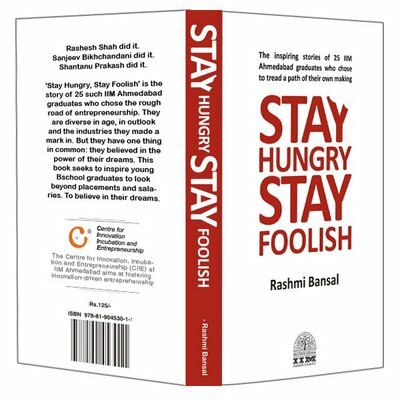 This entry was posted in Book Review, india, MBA and tagged Book Review, enterpreneurship, IIM, rashmi bansal, stay hungry stay foolish, steve. Bookmark the permalink. ← Where is Sajjanpur ? Good review…But yes, I agree that Rashmi should probably come out with a part 2 and cover examples of Non MBAs and their trials & tribulations. Indians are entrepreneurial in nature and I wish this book helps them further cement their aspirations ! Thanks for a very balanced review 🙂 May I use it on the ‘Stay Hungry’ book site? Thanks for dropping in 🙂 You can use the review. I must say you are a very talented writer and this indeed is a very good post. Thanks for mailing me the link. I have always been inspired with franchising and entrepreneurship and after reading your blog, I thought its high time I do something on my own rightaway, since I am too impatient to get my MBA from IIMA. Hence, I lauched this site called http://way2franchise.ning.com which is a social networking platform for anyone that has given entrepreneurship a thought. You have definitely got me interested in picking up a copy of the book from the nearest Book store this weekend. Looks like the book will at least manage to strike the entrepreneul chord in people, especially Indians…who are said to be having a natural inclination towards Entrepreneurship! I have included your blog in my blogroll. Thanks a lot for a nice review, i was really looking for a good review like yours for a long time. what about that Part-2, is that available in the market? I’m eagerly waiting for that, do let us know when that book is released to the market. Thank you. Thanks for posting it on BookReviews page too!